Whether Yahoo’s $1.1 billion purchase of Tumblr last year will help turn around the Web giant’s display ad woes isn’t yet clear. It has not provided a quick fix. Yahoo’s display ad sales fell 7% in the quarter, with overall revenue falling 3%, marking the fourth decline in the last five quarters. A new report from eMarketer today, however, indicates that the image-focused microblogging service continues to expand its user base in the U.S., boosting prospects for its potential as an ad platform. The research firm estimates the number of monthly Tumblr users in the U.S. grew 46% last year to 13.7 million, and projects this will increase another 25% this year to 17.1 million. Tumblr’s U.S. growth will taper off to the single digits in the out years of the forecast -- reaching 22.8 million users, or 12% of all social networks in the U.S. Still, that’s a far cry from the U.S. audiences of other social properties, such as Facebook, Twitter, Instagram and Pinterest. Furthermore, recent comScore data shows that Tumblr’s U.S.-based traffic has actually declined over the last year. While the number of mobile monthly visitors increased to 25.7 million in June from 19.8 million in the year-earlier period, desktop traffic slipped from 36.1 million to 23.3 million. This has left Tumblr with an overall digital audience of almost 43 million as of June, compared to 46.6 million a year ago. Even so, the eMarketer study points out factors in Tumblr’s favor from an advertising standpoint beyond simply audience size. One is its youthful user base. People ages 18-34 make up more than half (52.2%) of users who regularly log into the platform. By 2018, about 12 million regular Tumblr users will fall into that age range, remaining about half of the total. 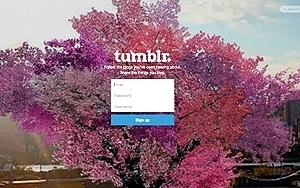 In addition, unlike most social networks that require users to log in to see and interact with advertising, anyone can view Tumblr ads. Since many Tumblr users run several blogs at a time, the site’s reach has greater potential than the user numbers might imply. For the record, Tumblr says it has 200 million blogs worldwide, which have generated 83.1 billion posts to date. “User engagement on Tumblr will be the most important factor for Yahoo going forward in terms of boosting the platform’s profile among advertisers,” noted Martín Utreras, senior forecasting analyst at eMarketer. eMarketer also pointed out that Yahoo has said the average sponsored (paid) post on Tumblr is reblogged 10,000 times. If the company can work with more of Tumblr’s most influential bloggers to host ads, it could help drive ad sales, especially on mobile. Yahoo CEO Marissa Mayer said during the company’s latest earnings call that Tumblr’s mobile engagement in the first quarter had more than doubled (up 122%) from the year earlier period. Yahoo itself hasn’t revealed much about ad results to date on Tumblr. At the start of the year, it announced enhanced targeting for sponsored posts, like age and gender, and the ability to purchase ads on a cost-per-engagement (CPE), such as likes, reflags, follows and clicks on sponsored posts. More recently, it extended Tumblr’s sponsored posts to the wider Yahoo network to broaden reach to its audience of 800 million globally.